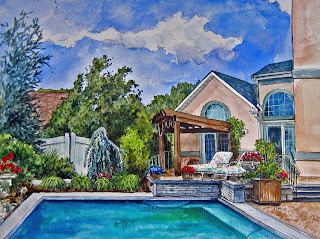 Here is a short notice commission...My client requested watercolor, this will be a gift for a retirement party, what a nice place to "retire" to!! ...I added ink 'cause it seemed bland to me. This is gorgeous. Your ink touches make it sing. Architecture is not the easiest thing to make look warm and inviting. Thanks Jo, I was really happy with this. I love my oils, but I guess it's good not to let go of watercolor completely. I used to do a lot more with ink like this. My personal christmas cards are often done in this method.